In today’s cloud age, where everything is available in an encrypted form customers’ data privacy and security is a huge concern for businesses. Though expecting unimpeachable data security is like expecting a unicorn, there are still many ways in which businesses can secure their customer data. That’s when AWS web services come into the picture. AWS is a cloud computing platform that gives customers ownership and control over their content, thereby protecting their data from impeachment. The platform is designed in a way that it prevents unauthorized access to or disclosure of customer content. 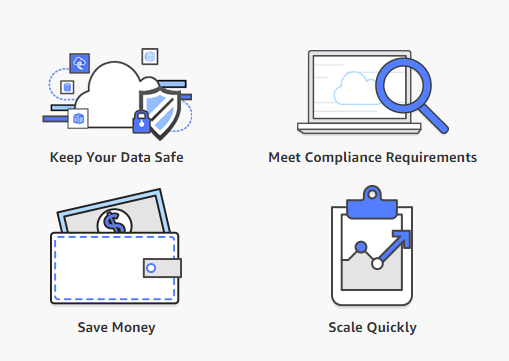 Continuing the discussion, the post highlights some of the key features of AWS Cloud Services that protect customers’ data. AWS comes with a set of access, encryption, and logging features that enable businesses to manage their customer content in an efficient manner. Also, AWS doesn’t use any customer content without clients consent. Businesses can choose any region to store their customer content. AWS doesn’t replicate their customer content outside the chosen zone without their consent. Clients have the provision to choose how their customer content can be secured. AWS web services secure customer data by giving customers an option of managing their own encryption keys. Customer content is not disclosed unless required by the law or there is government’s order to do so. In such scenarios, Amazon web services notify clients before disclosing their customer content so that they can seek protection of the content. Related read – Amazon Web Services vs Microsoft Azure: What’s Best For Your Business? AWS comes with a security assurance program comprised of best global privacy and data protection practices in the industry. The program is independently validated by multiple third-party independent assessments. Customers’ data security and privacy are one of the major concerns of businesses, but it can be taken care of if businesses choose progressive web services such as AWS. Amazon Web Services not only ensures complete data protection of customer’s data but also enable businesses to manage their customer content in an efficient manner. If you are also concerned about your customer data privacy, we at i2k2 Networks can help. All you need to do is call at 0120 466 3031 or request a callback.